Buy Magnifier Light - Magnifying lamp with stand, rectangle, white. Features: High quality rectangular Glass lens (17.75 x 15.5 cm). Strength of Magnifying Lamp is 5 dioptre (2.25 times). 2 x 9 watt (equal to 45 watt) compact Fluorescent bulbs. Includes heavy duty Table Clamp. Lamp Stand is a heavy 5 legged base. Return to base 12 month warranty. We send Magnifying Lamps Australia wide. Payments can also be arranged for internet banking or cheque. 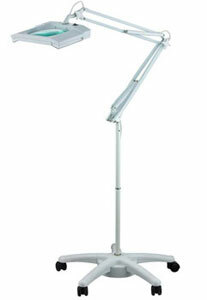 * Desk top Light, Clamp and Floor Lamp models available.